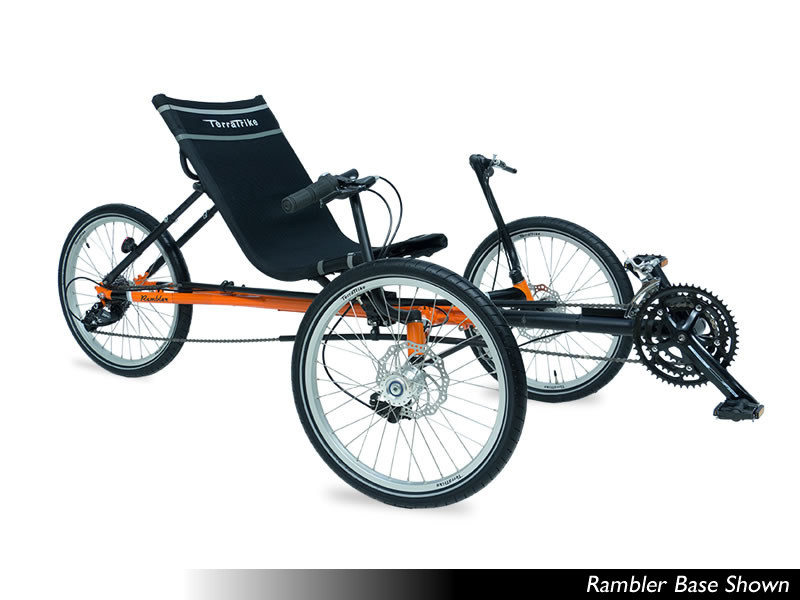 With it’s sleek styling, multiple gearing options, higher seat, and rounding tubing, the Rambler is the perfect cross between the Rover and the Tour II. It maintains the great geometry of the Rover while adding the lightweight frame and gearing of the Tour II. The Rambler features our new crossbow frame design fabricated from round chro-moly steel tubing with an adjustable aluminum boom. The new seat mount is infinitely adjustable, and the aluminum seat frame adds to its lightweight pedigree. The Rambler is available in a great sporty orange color with several decal options to customize to your liking. For those who want something truly unique, custom frame colors are also available for an extra charge. The Rambler’s seat reclines from 40 to 70 degrees allowing YOU to set the angle where you feel most comfortable. The infinitely adjustable seat also slides fore and aft allowing for quick adjustments for different sized riders. This trike is easy to get in and out of, and adjusts in seconds. The Rambler is also available with an 8 speed Nexus hub for even smoother shifting.